Good looking and super durable. It will stand up to slicing, dicing and chopping yet resilient anough to protect a knife's edge. 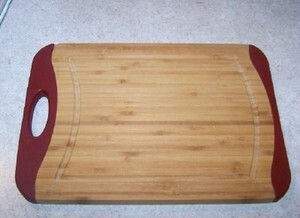 Nonslip silicone ends keep the board in place as you work. The cut out handle makes it easy to lift or retrieve. A groove in the surface catches juices as you work. 13" x 9". Hand wash only.